The importance of good health is a big part of Korean culture. "eels are good for stamina" - with a "wink" or smirk from a colleague/friend or even the restaurant staff. "sweet potatoes are good for a good bowel movement" - This one being pretty common among women especially. 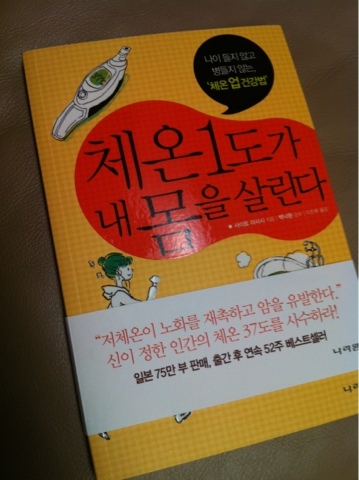 Korean women are not shy about talking about their bowel movement. "I've been constipated lately~" is an easy subject to bring up among friends. Even Korean "yogurt" ads on TV will blatantly tell you it's good for a "pleasant bowel movement" known as 쾌변 :) Heck, even some yogurts will have those two words on the bottle! BOOK REVIEW: This book talks about the benefits of a maintaining/increasing body temperature for good health. A cold, "lower temperature" body does not fight off self properly and gets ill easily. A proper temperature allows the body to fight off diseases and stay strong. When thinking back home in the states, temperatures at home/buildings are freezing cold. Bad enough that one has to bring a sweater on a summer day inside an office. Is this healthy? Try it, keep yourself warm and get being used to the "heat" our body produces. I actually used to hate "feeling hot". Now, I can't take "feeling cold". I haven't gotten a cold in 2+ years.